Insect Removal and Pest Control Services | Full-Service Extermination Solutions! Leading Exterminator Services in Southeast Michigan, Helping Local Residents Sleep Better! Centipedes are one of the many pests that are found in Michigan. Centipedes are oblong, flat-bodied insects which are characterized by their segmented bodies with a large quantity of legs attached to each one. Each centipede has anywhere from 15 to 177 pairs of legs per segment! Depending on the species, these insects range in size from 4 to 152 mm and commonly range from brown to reddish orange in color. These pests have small mouths and a pair of long and sensitive antennae attached to their heads. Additionally, they have large, claw-like structures that contain a venom gland that is used to hunt their prey, such as worms and spiders. We are so confident in our approach to eliminating bed bugs that we are the only Michigan bed bug company to offer a 6-month warranty on all bed bug extermination services! What is Common Behavior of Centipedes? Centipedes are nocturnal insects; however, they do enter buildings and houses during the day. During winter, they prefer moist, dark, and secluded areas, and place eggs in damp soil during the spring and summer. These insects prefer damp areas such as basements, closets, and bathrooms. They can live anywhere from a year up to six years. Centipedes do not eat wood. That is a characteristic of a millipede, an herbivore that closely resembles a centipede. While centipedes are venomous, the venom is not known to be harmful to humans, although the bite can sting similar to a bee sting. The only direct signs of a centipede invasion is the actual sighting of the centipede itself. They are agile, fast-moving, nocturnal insects, making detection difficult for humans. Treating for centipedes includes removing their food sources, sealing entry routes into the home or building, and reducing moisture when possible. An infestation can also be caused by water accumulated from the roof and moisture in the foundation of the dwelling. Also move all compost and wood material away from the house. A good way to gauge the severity of the infestation is to place sticky traps around the home. 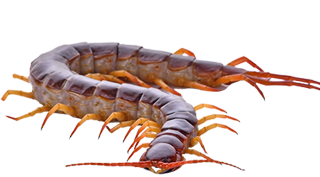 Centipedes can be exterminated at home, but it is best to contact your local pest control professional to ensure that they are properly treated. Chemical treatments can be effective in the short-term, but may give you a false sense of security in the long run. At Hi-Tech Pest Control, we combine these chemical treatments with a proactive approach towards centipede eradication. To find the source of the problem, we perform a full inspection of your home and help correct the risk factors for a centipede invasion, such as moisture problems, identification of holes, cracks, and gaps that enable these insects to come inside, high-risk clutter areas to clean up, reducing the number of insects that the pests prey on in the home, and removing all indoor centipedes with a vacuum. Call Hi-Tech Pest Control today, or request a free inspection! Whether you own a restaurant, office building, or a property manager, we got your business covered! Place pest control on auto-pilot. Let our experienced team manage your pest control needs. Learn more about common bed bugs including earwigs and fleas. Hi-Tech Pest Control has a wide variety of commercial Integrated Pest Management programs. We also offer residential IPM programs to fit your preventative pest maintenance needs. Call us at 248-569-8001 to start your Integrated Pest Management program today! From Pest Heat Treatments to Chemical Pest Treatments, we are your one-stop source for pest maintenance. Whether it crawls, flies, bites, or destroys — no matter how in-depth your pest problem is, Hi-Tech Pest Control can solve it! We pride ourselves on doing the jobs those other guys can’t do. Plus, with a 6-month money back guarantee and a free inspection, you have nothing to lose. Call Hi-Tech Pest Control today at 248-569-8001 to schedule your free inspection!